Guillain-Barré syndrome (GBS) is also called acute inflammatory demyelinating polyradiculoneuropathy (AIDP). It is a neurological disorder in which the body's immune system attacks the peripheral nervous system, the part of the nervous system outside the brain and spinal cord. The onset of GBS can be quite sudden and unexpected and requires immediate hospitalization. It can develop over a few days, or it may take up to several weeks with the greatest weakness occurring within the first couple of weeks after symptoms appear. GBS is rare, affecting about 3,000 people in the U.S. It can affect people at any age and both men and women equally. GBS often develops after a respiratory or gastrointestinal viral infection. It’s not clear why some people get GBS. What is known is that the body's immune system begins to attack the body itself. 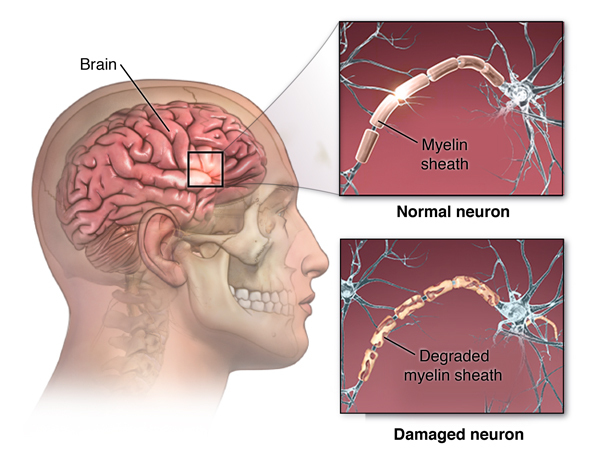 Normally, the cells of the immune system attack only foreign material and invading organisms, but in GBS, the immune system starts to destroy the myelin sheath that surrounds the axons of many nerve cells, and, sometimes, the axons themselves. When this occurs, the nerves can’t send signals efficiently, the muscles lose their ability to respond to the commands of the brain, and the brain receives fewer sensory signals from the rest of the body. The result is an inability to feel heat, pain, and other sensations. GBS can occur after a viral infection, surgery, injury, or a reaction to an immunization. These are the most common symptoms of GBS. But each person may have slightly different symptoms. The first symptom includes weakness or tingling sensations in the legs. This sometimes spreads to the arms and upper body. A neurological exam usually reveals a loss of all deep tendon reflexes. The symptoms may get worse. In some cases, you may not be able to use your muscles at all. You become paralyzed, and breathing is hard. Your blood pressure and heart function are affected. GBS is a medical emergency and needs to be treated promptly. Although symptoms can become life-threatening, partial recovery is possible from even the most severe cases of GBS. But you may always have some degree of weakness. The symptoms of GBS may look like other health conditions. Always talk with your healthcare provider for a diagnosis. The signs and symptoms of GBS vary. It can be difficult to diagnose in its earliest stages. High protein level in cerebral spinal fluid. This is the fluid that surrounds the spinal cord and brain. Spinal tap (lumbar puncture). 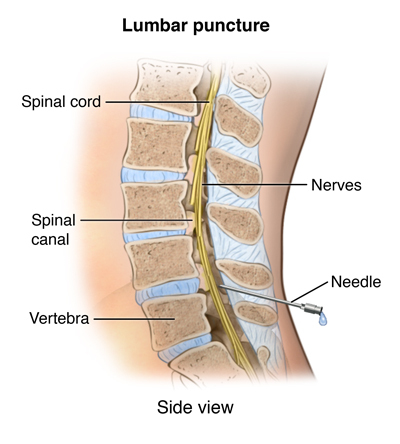 A special needle is placed into the lower back, into the spinal canal. This is the area around the spinal cord. The pressure in the spinal canal and brain can then be measured. A small amount of cerebral spinal fluid (CSF) can be removed and sent for testing to find out if there is an infection or other problems. Electrodiagnostic tests, such as electromyography (EMG) and nerve conduction velocity (NCV). These studies are done to evaluate and diagnose disorders of the muscles and motor neurons. Electrodes are inserted into the muscle, or placed on the skin overlying a muscle or muscle group, and electrical activity and muscle response are recorded. There is no known cure for GBS. The goal of treatment is to prevent breathing problems and relieve symptoms. You will need to stay in the hospital for treatment. Medicines are used to control pain and other conditions that may be present. In addition, you may get treatments, such as plasmapheresis or immunoglobulin, to suppress the immune system and reduce inflammation caused by the immune system’s response to the disease. Plasmapheresis is a procedure that removes the plasma (liquid part of the blood) and replaces it with other fluids. Antibodies are also removed with the plasma, which is thought to help reduce the symptoms of the disease. Immunoglobulin is a blood product that helps to decrease the immune system’s attack on the nervous system. Through research, new treatments for GBS are continually being identified. Guillain-Barré syndrome (GBS) is a neurological disorder in which the body's immune system attacks part of the peripheral nervous system. The onset can be quite sudden and unexpected and requires immediate hospitalization. The first symptoms include varying degrees of weakness or tingling sensations in the legs, which, sometimes, spreads to the arms and upper body. The goal of treatment is to prevent breathing problems and relieve symptoms. Recovery can be lengthy and residual muscle weakness or paralysis can occur.